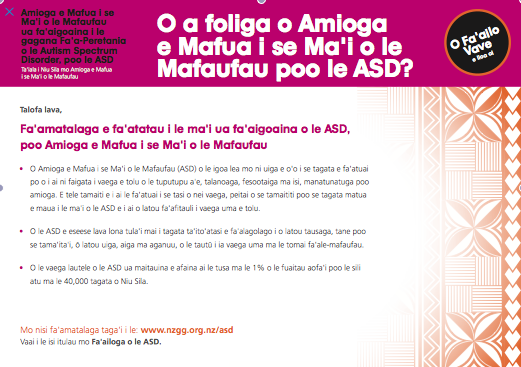 ​The NZ Autism Spectrum Disorder Guideline provides evidence-based information for people on the autism spectrum, their family and whanau, as well as health, disability and education professionals and social service agencies. It includes information about good practice that is evidence-based and aims to improve the health, educational and social outcomes for people with ASD. What we particularly like are the translated "Quick Cards for Recognition' resources in the Pasifika languages of Samoan, Tongan and Cook Island Maori and Maori.